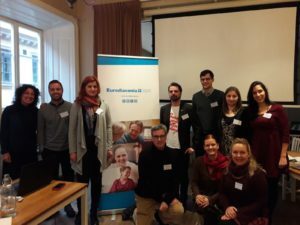 We have recently released the event report of the first meeting of our new thematic network on Access to Employment, organised earlier this month in Stockholm (Sweden). During our two-day network meeting, over 10 representatives from Eurodiaconia member organisations gathered in Stockholm to discuss issues of common interest on employment, with focus on support services for people with low employability, and share experiences and good practice in the field while identifying challenges and potential solutions. The meeting, hosted by our member Stockholm City Mission, was rich in exchange and reflection on the role of social services as levers of inclusive labour markets with opportunities for employment for all people. The participants had the opportunity to engage in a dialogue with the Swedish Public Employment Services, as well as to learn more about projects run by our members in the Czech Republic, Italy and Sweden, with emphasis on partnership with employers. Participants had also the chance to discover the work done in two of the social enterprises run by the Stockholm City Mission – the redistribution centre for 17 second-hand stores and a social supermarket – which offer different forms of employment, work training and vocational training for individuals outside the labour market. Lastly, the meeting enabled participants to learn more on Eurodiaconia policy work, by offering a state of play of the Council Recommendation on the integration of the long-term unemployed in the labour market, as well as through a policy workshop to build Eurodiaconia messages for a more inclusive labour market. A specific session was also dedicated to discussing strategies towards the labour market integration of third-country nationals. To know more about the Network Meeting report, please read the full document. To know more about the Council Recommendation on labour integration of long-term unemployed, please read the European Council document.